Summer is actually, finally, for real here, and that meant a sweaty ride down the hill and up again over to Federal Hill, making sure to take a hit of water at every red light. It’s no joke, riding on hills in this heat, so if you’re out there, do not forget the water. Or the sunscreen. Seriously, people–bring your supplies with you, and get a rack so you don’t have to lug a bag around on your back. Alright, enough preaching. It felt good to stretch my legs, in spite of the heat, because I just haven’t gotten enough miles in lately to feel like myself. Fortunately, that can be easily remedied by jumping on the Surly and speeding down the hill. Everything was just as I’d left it–drivers speeding around the traffic circles in Old Goucher, that one safety cone guarding the parking spot of that one Volvo, doors swinging open along the Montessori school by the Copycat building, buses bunching up near Monument, everybody trying to squeeze onto Lombard Street first, and then bike/ped path around the harbor, blocked this time by a couple of men laying new concrete around a fire hydrant. They didn’t want to move to let me squeeze myself and my bike by, and so I got to exercise my heavy sighs that reserved for frustration at those who do not share the roads. Like I said–nothing’s changed. I ended up at McHenry Row, same old trip, and stopped by the Starbucks after for a free birthday drink. You can get a really huge frappucino, I learned. And then I stopped by A. and K.’s, where everything’s changed, because they have a ten day old baby. I got to cradle her while we watched soccer, but mostly we just stared at that tiny wrinkled face, the furrowed brow of a creature for whom everything is brand new and cause for serious alarm. I was pretty much instantly in love with that turtle-without-a-shell, but then it was time to get back on the bike for the ride home. 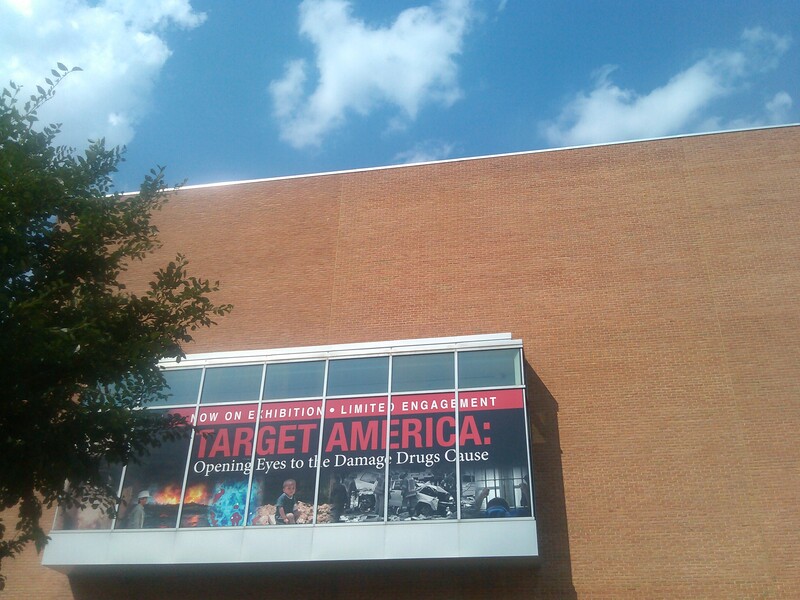 I stopped in front of the Maryland Science Center to snap a picture of this sign promoting their LIMITED ENGAGEMENT OMG TARGET AMERICA: OPENING EYES TO THE DAMAGE DRUGS CAUSE. How about an exhibit about the damage caused by the war on drugs? That sweet baby deserves a different world, and one where the Science Center is all about dinosaur bones and how bubbles work, not stories about drugs divorced from the political, social, and economic contexts of drug economies and addiction. I got back on my bike and sweated the rest of the ride home to air conditioning and a whole lot more water. This entry was posted in museums, personal, politics and tagged Baltimore, drug wars, Federal Hill, Maryland Science Center, new babies. Bookmark the permalink.